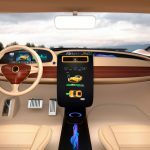 Every year, the auto industry attempts to innovate new ways to make the driving experience “smarter” to compete with the rapidly changing smartphone and device segment. The in-dash infotainment center (the words “information” and “entertainment” combined) is their best chance to grab your attention (and your data) when you are driving your vehicle. Some infotainment features include hands-free voice technology, apps, integrated GPS, and 4G-connectivity capabilities. These are just some of the functions we as consumers are aware of. But what about the other capabilities our infotainment systems have that we generally take for granted or do not even know exist? The road atlas has gone the way of the cassette player. Today it’s instinct to plug our destination into the vehicle GPS or our phones. Vehicle GPS systems either use their own third-party connectivity to an outside data source (like OnStar, satellite, or an integrated 4G cellular connection) or they piggyback off of your phone’s cellular connection. This is telematics – the ability for your vehicle to remotely connect to an outside data source to feed real-time information back to your four wheels of steel. It’s been standard in commercial vehicles for years. It is second nature to connect our smartphones via Bluetooth or a wired USB connection to our vehicle (think about how many times you have done this with a rental vehicle). What you don’t know, however, is that the many other functions performed by these infotainment centers/telematics systems are being recorded behind the scenes. More importantly, what these systems are storing about your driving history, telephone calls, text messaging habits, call log histories, and more will surprise you. Integrated telematics and infotainment systems can act as a secondary “black box”, storing information a typical Event Data Recorder (EDR/Black Box) will not record. This information can include months (sometimes years) of navigation data from the GPS, SMS messaging data from a phone (if paired wirelessly through Bluetooth or through a wired USB connection); what phone number and device were paired to the vehicle and the date, time and location the device was paired; the apps used on the vehicle’s touchscreen interface; and even when and where a door was opened or closed. ARCCA is an industry leader with respect to this new technology, known as Infotainment and Telematics Vehicle Systems Forensics. Consider a scenario where a 2014 Ford Fusion with a SYNC MyFord Touch system impacts another vehicle at dusk. There are concerns that the driver of the Ford was distracted at the time of the accident, although he denies this. In addition, the other driver is claiming that the Ford’s lights were not on. By removing the SYNC module, ARCCA’s reconstructionists imaged all of the available information stored in the vehicle’s SYNC system, similar to an EDR. Through ARCCA’s infotainment download of the Ford, we discovered that the driver received a call 4 seconds prior to the accident and that he failed to turn on his headlights when leaving work. The driver sent three text messages in the minute preceding the accident, and the download showed the messages, times, and recipient, which occurred while the Ford driver was traveling 65 MPH on the highway. This scenario highlights critical case-specific information that was previously inaccessible. However, ARCCA is now able to retrieve this data from vehicles manufactured by Ford, GM, FCA, BMW, Toyota, and more. If you are interested in more information about ARCCA’s infotainment and telematics vehicle downloads, email CrashAxe@arcca.com.